If you are new to this blog, welcome! Before you start reading, you may want to check out the new link above called From The Beginning. 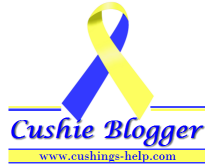 It explains my story with Cushing's and how to get help if you think you may have Cushing's Syndrome. Another good post to check out is Why I Blog About My Health, which is pretty self explanatory. I hope you find some useful information, please feel free to email me at lifewithcushings at gmail dot com if you have any questions or if I can help you through this in any way.